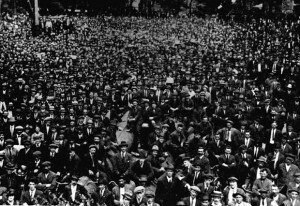 Winnipeg General Strike - Victoria Park: Caption Winnipeg Strike -1919. Meeting in Victoria Park. Source: The University of Manitoba, Winnipeg Tribune Photo Collection : Winnipeg - General Strike 1919. After taking in the sold-out final night of the second annual production of Strike! The Musical during a recent research trip in Winnipeg, I felt compelled to explore Winnipeg’s commemoration of the strike a little more deeply. Schur is undoubtedly an important local force in education and awareness of the legacy of the strike. 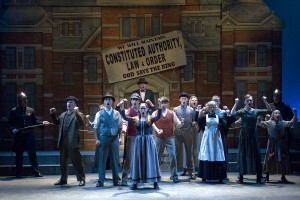 His musical, which he co-wrote with Rick Chafe, has been produced twice indoors in Winnipeg and once in Saskatoon, and was even staged outside Winnipeg’s City Hall (a focal point of the 1919 violence) in the summer of 2009 for a crowd of over 5,000. He has developed teaching materials and curriculum-based kits for teachers (in Manitoba the strike is now part of Grade 6 and 11 curricula). He also is working on securing performance space for the production with the new Canadian Museum for Human Rights. 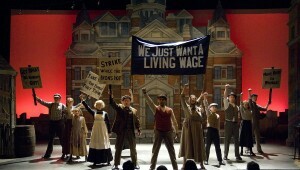 Furthermore, after last year’s outdoor staging of the musical, he donated the replica streetcar used in the show to become a free museum in Winnipeg’s downtown which interprets the history of the streetcar in Winnipeg as well as its iconic moment in the Winnipeg General Strike. Finally, he also runs an annual public walking tour focused on the life of Sokolowski. In recent years, perhaps inspired by Schur’s work, the Winnipeg Exchange District Business Association has begun to run a General Strike themed walking tour as part of its tourism strategy (though it was developed only in recent years). Ultimatum09: The cast of the 2009 Winnipeg annual production of Strike! in Winnipeg singing "Ultimatum." Photo by Andrew Sikorsky. 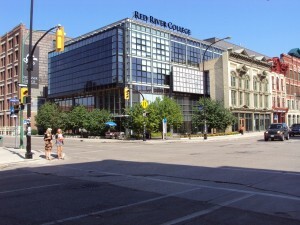 Schur’s research and writing of the play – for which he interviewed locals who lived in Winnipeg during the strike as well as family members of strikers, did archival work and read enough secondary material on the strike to “be able to write a book about how scholarly opinion on the strike diverges” – came shortly after the designation of Winnipeg’s Exchange District as a National Historic site by the National Historic Sites and Monuments Board. Protected by municipal and provincial heritage legislation, the Exchange District is experiencing a renaissance of sorts as new trendy condo developments and businesses move back into the former industrial and banking focused area of the city. As in many cases of historical preservation and urban revitalization, the question often arises: which history to preserve, and in whose interests? Many of the landmarks of the Winnipeg General Strike, such as Victoria Park (site of numerous rallies and staging point for many marches) and the Winnipeg Labour Temple, have long since been paved over in favour of parking lots or newer buildings, while the strike itself is only commemorated on a small plaque near the newer city hall building. Strike! has helped revive interest in the legacy of the strike, and could very well represent an important beachhead in allowing for more historical experiences and voices to be heard in Winnipeg’s growing historical tourism sector, particularly as it prepares to welcome the Canadian Museum for Human Rights.